Congratulations to Andy Frankenberger, Winner of Event #28: $1,500 No Limit Hold'em ($599,153)! A mere three days ago 2,500 people decided to test their skill and their luck against a massive field for a shot at a gold WSOP bracelet and $599,153 in first place prize money. Now after 2,499 eliminations, just one man stands. Andy Frankenberger was able to defeat Joshua Evans heads up and grab WSOP glory. When play began three days ago, the Pavilion at Rio-All-Suites Hotel and Casino was jam packed with players looking to take their shot at a WSOP event. With $1,500 being one of the lowest buy-in tournaments, the field had a breadth of players ranging from amateurs to professionals. Day one saw many casualties of notable professionals including Freddy Deeb, Liv Boeree, Joe Sebok, Phil Laak, and PokerNews’ own Rich Ryan. That being said, 349 players were able to overcome the large field and progress on to the second day of the event. Players such as Rick Romine and Roberto Wantanbe were able to turn their starting stacks of 4,500 chips into massive castles of chips that towered over the competition, totaling over 150,000 each. When play began on day two, the casualties came fast and brutal. Players were constantly heard complaining of aces over kings and similar coolers. We even documented a preflop all in of red aces versus black aces versus kings. 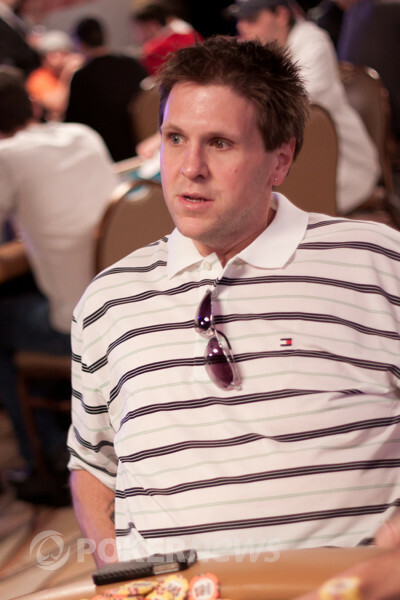 Several notable players including Matt Affleck, Vanessa Selbst, Sumanth Reddy, Michael Katz, and our day one chip leader Rick Romine were sent to the rail, victims of the vicious day two play. In the end, 28 players were able to survive ten more hectic levels of play and charge on through their quest to earn a gold bracelet. Day three kicked off almost as fast as day two ended, with a flurry of eliminations within the first fifteen minutes of play. After two hours of play, we were down to our final nine contenders. Steven Merrifield led way with Andy Frankenberger and Joshua Evans rounding out the top three. Eliminations continued to come fast throughout the day as one by one, players were sent on the long walk away from the ESPN Main Stage and toward the rail. Eventually Andy Frankenberger and Joshua Evans found each other heads up. Frankenberger began heads up play with a severe chip disadvantage but was able to catch a huge double up when his beat Evans’ . From that point on Frankenberger continued to play small ball until he was able to get it all in with top two pair against Evan’s top pair. Frankenberger won the World Poker Tour Player of the Year title for 2010 and now has made 2011 a worthwhile year as well, adding a gold WSOP bracelet and $599,153 to his collection of tournament accolades. PokerNews extends congratulations to Frankenberger on his huge achievement! Thanks for following our coverage of this event and stay tuned to PokerNews throughout the rest of the World Series of Poker for the most up to date coverage! Joshua Evans had the button and raised to 125,000, Andy Frankenberger called, and the flop fell . Frankenberger checked, Evans fired 180,000, and Frankenberger check-raised to 600,000. Evans moved all in for nearly 2.5 million, and Frankenberger made the call. Evans needed a ten or running diamonds to survive, and his hopes for a flush were dashed when the fell on the turn. Only a ten could save him now, but it wasn't to be as the bricked on the river. Evans has had a great year thus far, and despite finishing runner-up, he still walks home with a whopping $372,498. Joshua Evans limped on the button, Andy Frankenberger checked in the big blind, and the flop came down . Frankenberger checked, Evans fired 65,000, Frankenberger check-raised to 150,000, and Evans called. The turn was the , and Frankenberger led for 225,000. Evans called. Both players checked the on the river, and Frankenberger opened up for two pair. Evans showed before mucking, and Frankenberger won the pot. The flop came and there were some cheers from Evans' section of those who were yet to realize that Frankenberger had flopped Broadway. Now Evans needed a king to chop, but did not get there as the turn and river came and . Frankenberger has now taken the chip lead. Andy Frankenberger had the button and raised to 100,000. Joshua Evans called, and the flop came down . Evans check-called 100,000 from Frankenberger, and the turn was the . Evans checked, Frankenberger tossed out 150,000, and Evans called. Both players checked the on the river, Evans opened up for a pair of eights, and Frankenberger tabled for a pair of nines. The nines were good, and Frankenberger shipped the pot. Andy Frankenberger started the hand on the buttonand made it 100,000 to go. Josh Evans made the call and the flop fell . The action checked around and the struck the turn. Evans led out for 225,000 and Frankenberger called. The board paired when the came on the river and Evans checked. Frankenberger pushed out a bet of 200,000 and Evans quickly raised it to 1,125,000. Frankenberger made the call but tossed his cards into the muck after Evans turned up for a turned straight. This hand has been the biggest we've seen so far in heads up play, with most hands resulting in walks preflop or a preflop raise being enough to take down the blinds and antes. Neither Joshua Evans nor Andy Frankenberger are strangers to success on the felt. 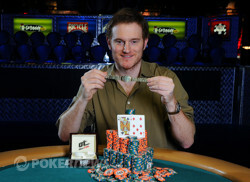 Frankenberger enjoyed over $1.2 million in earnings during 2010, and won the World Poker Tour Player of the Year title. 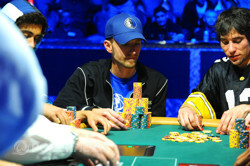 Evans went on a tear during the 2011 World Series of Poker Circuit, cashing eight times, and making four final tables. 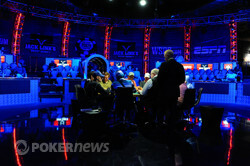 One of those final tables was at the Nation Championship held at Caesars Palace this past may. Evans took third for $135,000 - his biggest score to date. We have only seen one flop in the past dozen-or-so hands. It's mostly been raise and take, and seeing that these two are so deep, we could be in for a long match.